Alright, 12th man, listen up! So your little guy or gal has been a Seahawks backer since day one. Of course, he or she wore the Hawks onesie when they were bouncing in their rocker and you wrapped your baby in the Marshawn Lynch jersey too and took pictures for Instagram. But now your child is upright and running around on Sundays waving a pennant and hollering his/her head off. Sure, they might not understand the plays, or the significance of a solid tight end who can run the perfect curl route, but the enthusiasm is there. And enthusiasm is what really defines a 12th man. This kid is already a die hard and is ready for the next step. 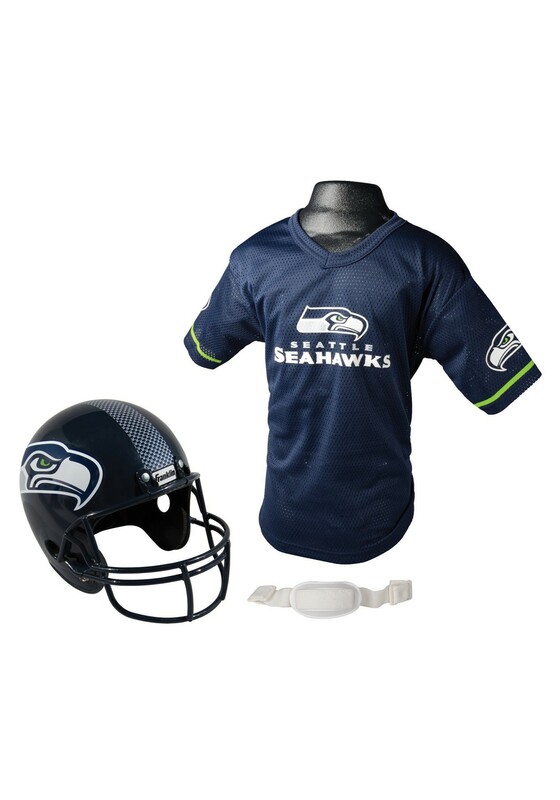 So throw a real parenting touchdown by getting this incredible Seahawks helmet and jersey! Is your kid going to be wearing it every day from the start of football season until... well, the start of the next football season? Probably! Will it maybe involve throwing the football around the house a bit too close to that lamp? Probably! But those are the sacrifices fans need to make for the team, not just for our beloved Seahawks, but for the unforgettable moments of your little champ: suiting up, imagining that incredible, last second one-handed catch and showing off that impeccable touchdown celebration (which would probably draw a penalty flag but who cares!). You've been hoping you can play catch with this kid and now finally, at long last, they'll be asking you! This costume isn't just a costume, it's a way of life. That's why we love football. That's why we root for our team. Because it brings us together for those moments of greatness, both big and small, that we always hope for and will always cherish. Suit up, kid. It's time to bring home the championship!